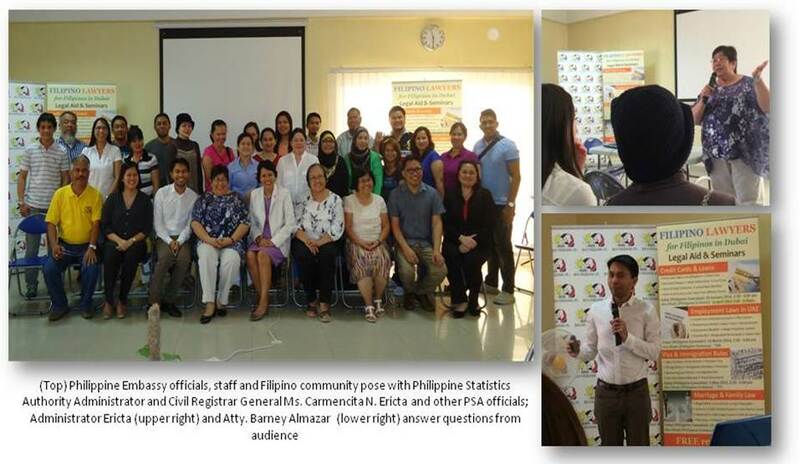 30 April 2014 -In line with its efforts to educate the large Filipino community in the United Arab Emirates (UAE) on laws and regulations affecting their lives, the Philippine Embassy in Abu Dhabi held a seminar on Philippine civil registration laws and procedures on April 25. It was conducted by Ms. Carmencita N. Ericta, National Statistics Office Administrator and Civil Registrar General, together with Ms. Lourdes Hufana and Mr. Joseph Cajita, both Directors of Philippine Statistics Authority (formerly National Statistics Office). Requirements, procedures and related issues on civil registry documents such as birth certificate, marriage certificate and death certificate were discussed during the seminar. Laws and regulations related to civil registry such as Republic Act 9048, Republic Act 10172, and Republic Act 9225 were also presented and tackled. The seminar was held in conjunction with the free legal seminar on the UAE marriage and family laws which was conducted by Atty. Barney Almazar of Gulf Law. Legal tips and reminders in finding a home in UAE and acquiring a residence visa for family members were discussed by Atty. Almazar. Several questions related to annulment, nullity of marriage, custody of children were also answered by Atty. Almazar. For the year 2014, the Embassy has partnered with Gulf Law in conducting a series of legal seminars for the benefit of the large Filipino community in the UAE. The first in the series was the Legal Seminar on Credit Card and Bank Loans held last April 11.